Do Apple Cider Vinegar, Coconut Oil, and Green Tea really promote weight loss or is that just a myth? You hear about so many foods that supposedly promote weight loss? But are they really true? 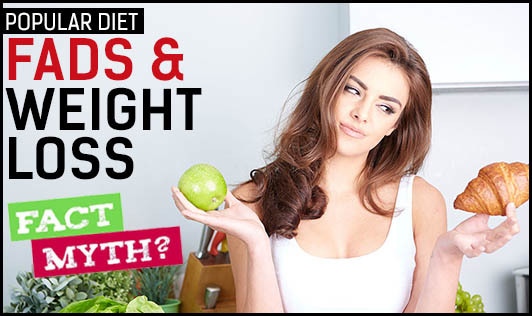 Let us put together a few of the latest food fads that people are considering for weight loss. Because it is always good to know what is real and what is not, right? Studies have shown that sipping on a little vinegar before meals makes you feel full, preventing over eating, and thereby promoting weight loss. In a recent study published in the Journal of Functional Foods, the results showed that a little apple cider vinegar every day slowed the release of glucose into the blood, improving insulin sensitivity. The vinegar surely helps you prevent your blood sugar from spiking drastically and therefore helps in weight loss; however drinking acidic vinegar can irritate your throat and strip the enamel off your teeth. According to a study published in the American Journal of Clinical Nutrition, participants who drank tea fortified with green tea extract for 3 months lost more body fat than those who drank tea with no green tea extract added. Green tea contains anti-inflammatory catechins which not only help to fight cancer but also affect the body fat levels. Coconut oil has been hyped for promoting weight loss. Several studies in the past have suggested that when participants consumed 30ml of coconut oil over the course of 1 to 4 months their waist circumference reduced. However, there isn't much proof supporting the actual weight loss. Moreover, coconut oil is way too high in calories and saturated fats.